Ten Squads, Ten Stories is a series that concentrates on one team in the National Women’s Soccer League (NWSL), and highlights a player or theme. This installment features Chicago Red Stars players Arin Gilliland and Courtney Raetzman, University of Kentucky alumnae playing together again the professional level. “If you want to be a pro, there’s a level of work and a level of attention to detail that is involved. I’m going to help you get there but you are really going to need to focus on being your best,” Jon Lipsitz, head women’s soccer coach at the University of Kentucky said. Lipsitz has been creating that atmosphere in Lexington since he took over the head coaching position prior to the 2009 women’s soccer season at the University of Kentucky. His job was to establish the program as a women’s soccer power, as well as create an environment in which players build and grow to their maximum potential. It’s paid off — the Wildcats have appeared in the SEC tournament in the past six seasons and qualified for the NCAA Tournament in four of the past five seasons. Out of that success, Kentucky is seeing players make the jump from the college game to the professional ranks. Two such players are Arin Gilliland and Courtney Raetzman, who are teammates once again in Chicago after playing together at Kentucky for three seasons (2012–2014). 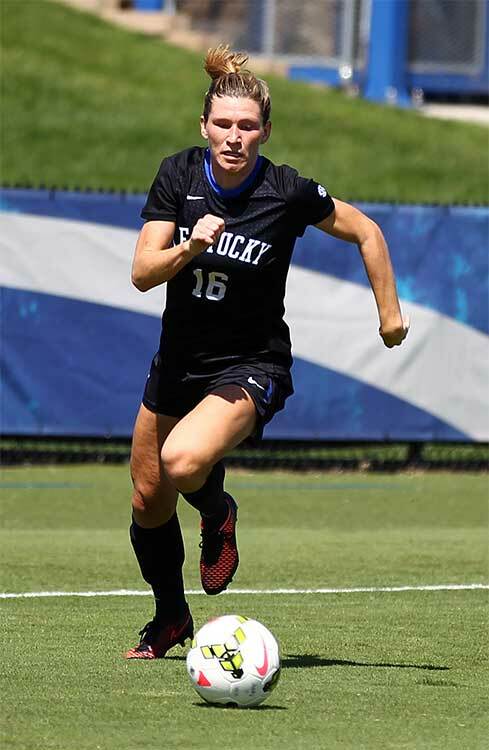 Gilliland, now in her second year with the Red Stars, and a two-time All-American in college, credited the way the Kentucky program has established itself as a strong program and was surrounded by great players, which helped her improve to get to the next level. 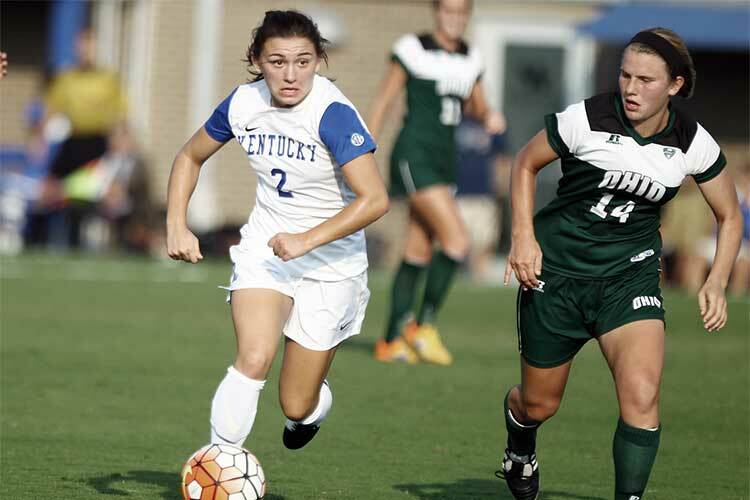 Gilliland said she played almost every position during her four years at Kentucky, from target striker to outside back. Developing the skills necessary to be an all-around player while in college is one reason Gilliland feels she’s had a successful start to her professional career. Whether it was the one year where she led the team in shots (100) and assists (10) in 2013 or goals (14) in 2014 or helping the defense pick up clean sheets as a defender, she did a little bit of everything for the team. Unlike Gilliland, who played all over the field, Courtney Raetzman filled a different role on the field for Lipsitz. After making the transition to the college game and recovering from a medial collateral ligament injury in her sophomore year, she made the move to a deeper-lying position in the midfield the following season. It was when the midfield move happened that Lipsitz saw Raetzman’s drive and will and knew she had what it takes to transition to the professional level. Raetzman’s tireless work ethic dates back to her younger days. She’s always wanted to do her best, work hard, and be the ultimate team player. At Kentucky she was surrounded by players who worked with that same mentality, which ultimately pushed her to work harder. 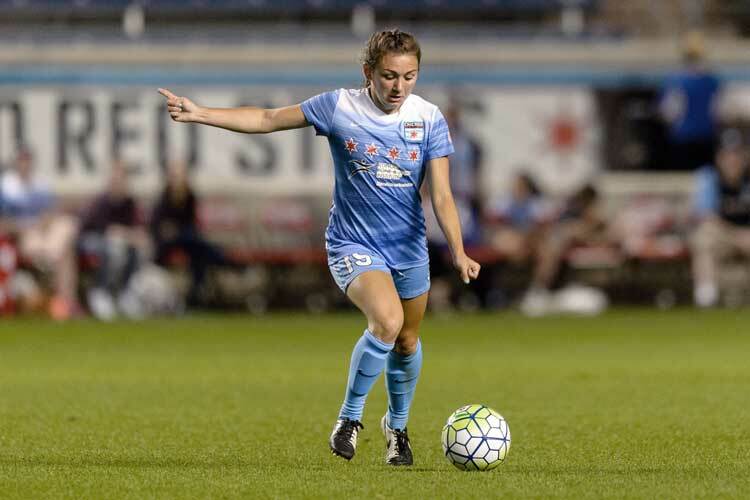 After Gilliland was selected in the first round of the 2015 NWSL Draft by the Red Stars, she put together a very strong rookie campaign en route to being named to the All-NWSL Second Team. She started in 17 of the 19 games she played in during the regular season and chipped in a pair of assists and started in the semifinal against FC Kansas City. While Gilliland was enjoying her rookie season in Chicago, Raetzman was having a standout senior season at Kentucky. She was named to the All-SEC First Team and started all 20 of her team’s matches, adding her name to the pool of possible NWSL draft picks. The Red Stars already have a duo who share an alma mater in Julie Johnston and Sofia Huerta, both of whom attended Santa Clara (Huerta finished school one year after Johnston). And with Raetzman being a Chicagoland native, the possibility of becoming a Red Stars prospect almost seemed natural. A year before, Lipsitz started getting phone calls from Rory Dames, the head coach of the Red Stars, about Gilliland when she was a senior. There was some prior familiarity between the two coaches; Lipsitz started the Ohio Premier soccer club in Columbus and often coached against Dames, who coached the Eclipse Soccer Club. When the phone rang again in Lipsitz’s office in late 2015, it was again Dames, who wanted to talk about Raetzman. Lipsitz couldn’t have been more thrilled, just as he had been when he spoke with Dames about Gilliland. When NWSL Commissioner Jeff Plush called out Raetzman’s name this past January at the draft in Baltimore, she knew she was headed back home to play the game she loved. 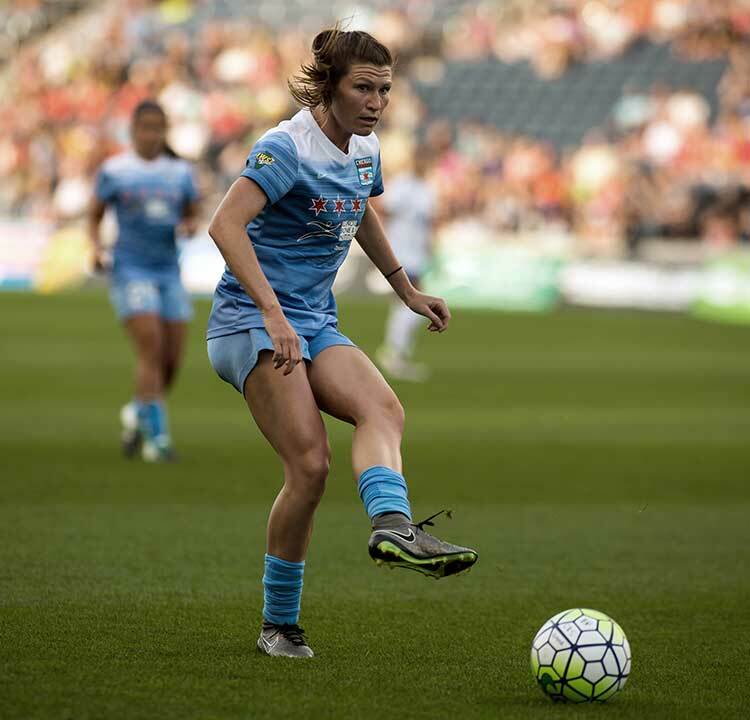 Coming into the final stretch of the season after the Rio 2016 Olympics break, the Chicago Red Stars find themselves in fourth place and four points out of first. Both Gilliland and Raetzman know that it will be a grind to the finish after the break and hope to help guide their team to the playoffs for a second consecutive season. Gilliland says the team’s goal is the same from a year ago, but the team wants to have a different mentality. She now believes things are starting to click as the season heads toward it’s final few weeks. “For a team that has got a lot of very, very good soccer players with very good soccer IQs, rather than being that blue-collar team [from 2015] that pushed through to get results — that’s still something we still want to have but we are trying to evolve ourselves to being a blue-collar, soccer-minded team — I think we have been struggling to find our identity with that and to make it work, but it has been coming together these past few games and our practices have been really good,” she said. While Gilliland continues to lead by example on the field, she has also been a mentor to her former UK teammates as well. Raetzman, like many NWSL rookies, has to deal with a big transition from college to the professional game. It always helps having someone you know well in your corner and who you can go to for guidance on being successful in the NWSL. While both players continue to set goals, be it a call-up to the national team or establishing themselves in the league, Lipsitz knows that his two former players have the energy and will to keep pushing toward reaching those goals.